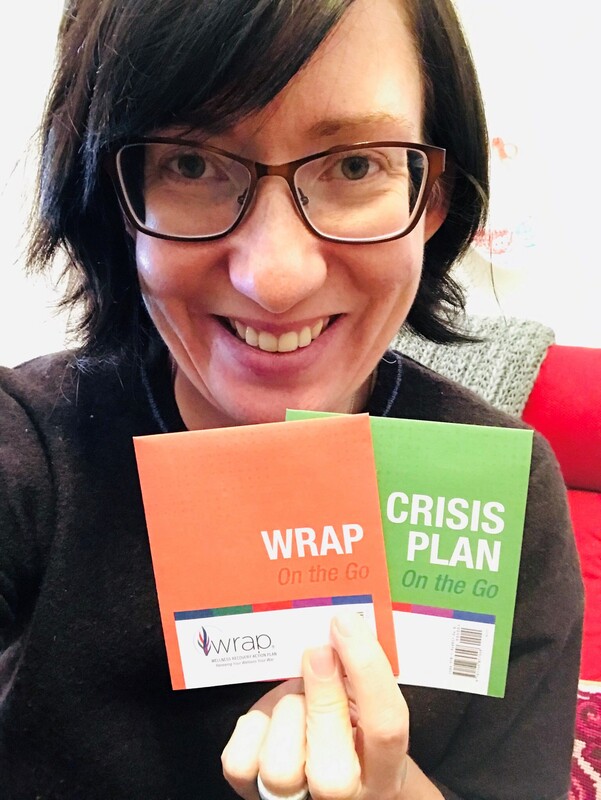 Kristen King, MPS, WRAP Project Manager and Certified WRAP Facilitator, Advocates for Human Potential, Inc.
At the end of each year, I love to look back on the last 12 months and reflect on how my life is going. This year has been a big one for me and for my family and friends. There have been births, deaths, friendships made and lost, big transitions, new opportunities, anniversaries, challenges, great joys, and sorrowful losses. There’s a lot to celebrate, and plenty I’d love to just forget about. But forgetting doesn’t work very well, as it’s turned out. For me, the joy of the good stuff fades, and the stuff that didn’t serve me well keeps coming back around. I’ve learned over time that through reflection and planning I can create a next year that has more to celebrate and lessen the amount (or at least the impact) of the events I really didn’t enjoy. In the past, I’ve done my reflection with the help of articles with titles like “50 Questions to Review Your Year” and “20 Questions to Reflect on 2017.” It was always helpful, but somehow it didn’t feel right. I never made it through the whole list of questions, and my reflections seldom turned into actions. I did get some good from it, but my gut told me there was something more, something I was missing. This year, I’m approaching my reflection a little differently. 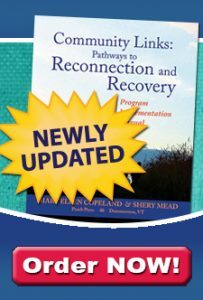 Instead of reflecting on my year and updating my WRAP in two separate activities, I’m doing them together with the revised WRAP Workbook. Since I started using WRAP in 2009, I’ve really just been updating my original plan every few months and at the end of the year. Now, things feel different for me and it’s time for a fresh start. Kristen’s WRAP binder and new WRAP Workbook. Earlier this week I plopped down on the floor with my current WRAP, a shiny new WRAP Workbook, and a cup of tea and rolled up my sleeves. 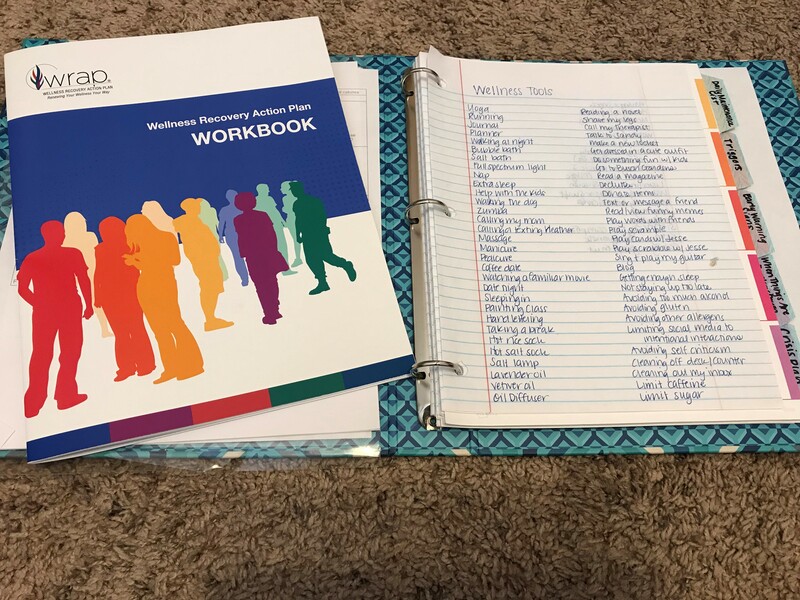 Instead of starting at the beginning like I usually do, I flipped to page 20 and the section “My Wellness My Way” (this is the revised workbook released in fall 2018, not the original workbook). Thinking about what 2017 has been like for me, I answered each of the questions. When I was done, I highlighted the areas I feel really good about and, in a different color, the ones I’m not happy with. I spent some time journaling in a separate notebook about what was working and what wasn’t based on my responses in that table. After I felt like I had written everything I wanted to write in my journal, I turned back to the WRAP Workbook and filled in the “Areas to Change” on page 21. I brainstormed some action steps that could help me make adjustments in those areas, with most of my ideas coming from the journaling I had just done. Next, I’ll be working on the chart on Workbook pages 22–25, where I get to think about how my life would look if I were living it exactly the way I wanted. In a future article I’ll share about that process, as well as how I’m using this approach to build my new WRAP. Meanwhile, if it feels right to you, I invite you to join me in reflecting on your year with WRAP. 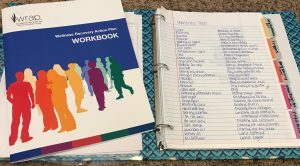 Look at the charts in the new workbook. Think about how things are going for you and what you’d like to keep or adjust. I’d love to hear what comes up for you. Please leave a comment on our Facebook page about your yearly reflection and how you’re updating your WRAP for the coming year.